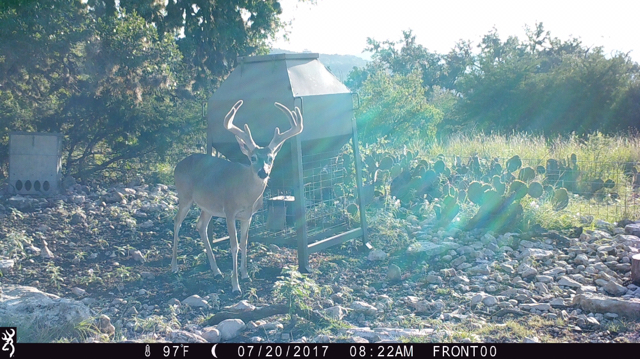 I know there are a handful of others that primarily hunt in Edwards County, and we don't seem to fit well into the other existing geographical threads. I hunt in SE Edwards county on a family members ranch. Feeders were filled up 1.5 weeks ago and I'm looking forward to checking the cameras I put out. I'm running 4 Strike Force cams. My neighbor said we got a good rain early this morning (southwestern part of the county). Our weather station is reading 0.02" for today. We are a ways North of Camp Wood/Barksdale. I'm south of town on377. Just got Sunday and everything looked good. 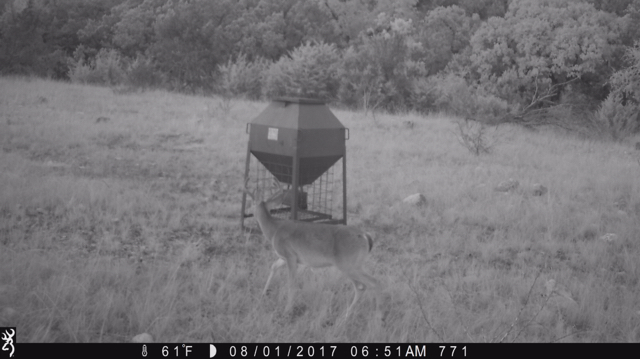 Filled the feeders and deer were under them that evening. It should be a good season. Just got back from our lease 16mi west on 377. We got rain Tuesday night and a little bit Wednesday night. We feed year round corn, and protein Feb - Aug. Lots of deer and hogs where we're at. A few exotics. But not as many we would like. 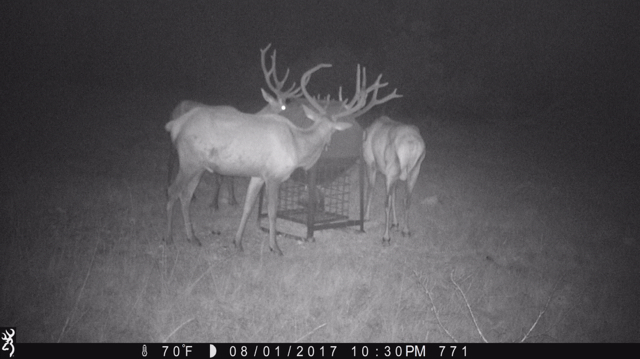 Some promising bucks this year (for our area). I'm about 5 miles south of Rocksprings off 55. Just came home Sunday. All looking good. It was a beautiful weekend with a nice breeze. Feeder are full and hoping for a decent dove shoot labor day weekend. A good portion of our place is on the western border of Edwards. I'll be lurking. Turkey ridge or deer valley ? I hunt just out of Barksdale. Getting dry but I do have some nice deer on camera already. 12 miles south of Rocksprings on 55, loading feeders and working on property. New to Edwards and hoping for a good year. 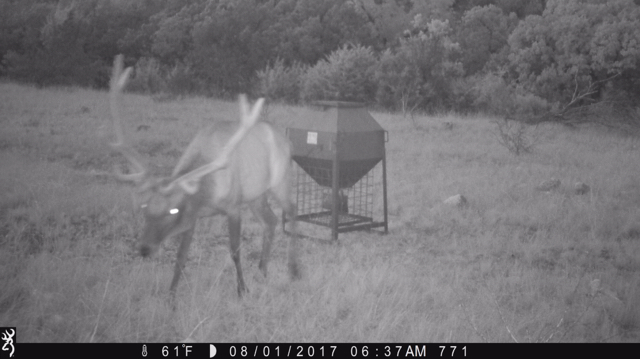 Might go this coming weekend for last minute archery season preparation..
Not going to be able to check my cams until Sept 8th, but was looking through old pics and thought this was interesting. That fawn looks pretty close to being a newborn. Whitetail gestation is 201 days, meaning that doe was bred around November 16th. I just purchased 35ac off 377 last month. I have had a feeder running on it since March, with Protein, Peas and Corn. Seen many Hogs, turkey and Whitetail, and a single Axis. It's very green in my neck of the woods, been getting just enough rain to keep it that way. The population seems to be healthy. 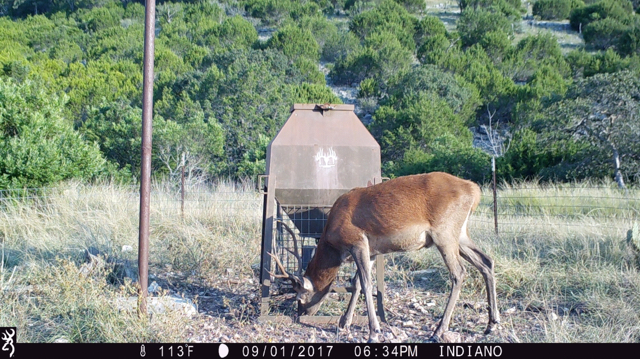 I don't think I will be hunting it too much this year as I still have my lease in Valverde county, and I need to build a cabin. I have a 5th wheel trailer that i will move out there and call home for now, and out of courtesy I don't plan on building my cabin until the general season is over. Good luck to everyone in Edwards county this year and keep safe! Going to start hunting 100 acres 20 miles south on 377. First year. Pulled cards last week on cameras and was pleasantly surprised. Looks to be a good year. I am about 15 miles north of Rocksprings. We've had a decent amount of rain throughout Summer. I sat in the blind last weekend and saw plenty of whitetail and Axis. 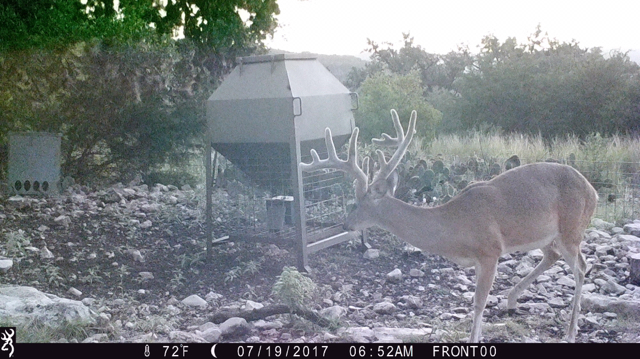 The whitetail herd seems to be improving. Im south of Rocksprings down 377 off CR 460. 84 acres next to a huge ranch. Too many hogs, plenty of deer. Few exotics, but beautiful country on top of a hill. I'm just west of town past the school a few miles. I'll post some pics when I get my camera cards back. 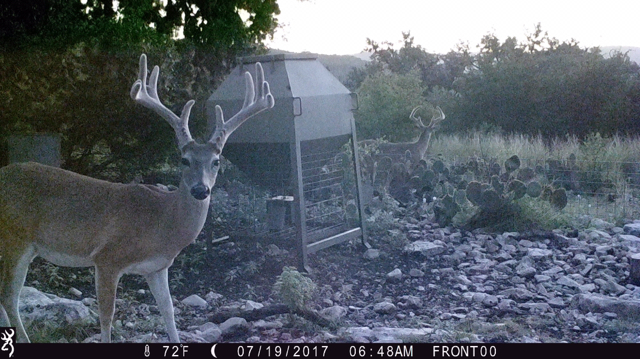 Headed out today to brush in blinds and check cameras, hoping for a lot of picture activity as I have 4 cams spread out on the ranch. 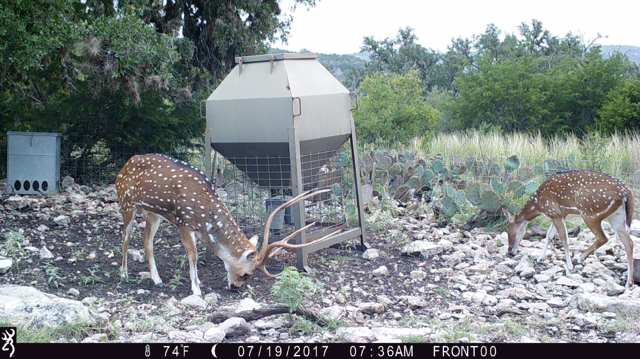 We stopped feeding in February; I went to the ranch with The Texan on 7/28-7/31 to service all the feeders. He and I dumped out any remaining corn in the feeders, feeders were filled 8/4. Last year I had elk pics from April through May until the feeders ran out. 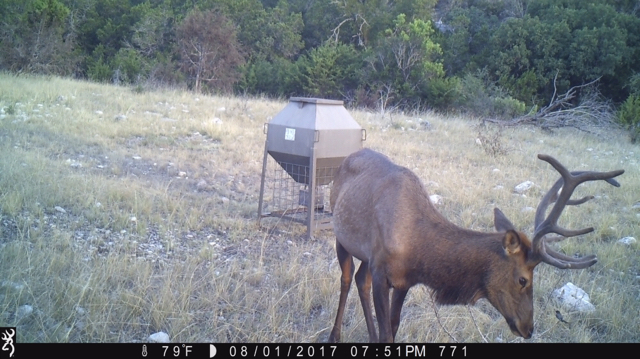 Next summer I will run 1 or 2 feeders Year round and am going to try and kill a free range Texas elk. Last edited by Patton; 09-09-2017 at 11:24 PM. Hunt off of 41 & 230. We had a lot of Axis earlier in the year around Feb. through April, but only get one or 2 a month now on camera. We have fed corn, Alfalfa, and deer mix all year. We have a few small whitetail and lots of hogs. I just got back tonight from out there and everything is still green. It doesn't look like it is going to be a very good season for me. Went out to our ranch this weekend.. 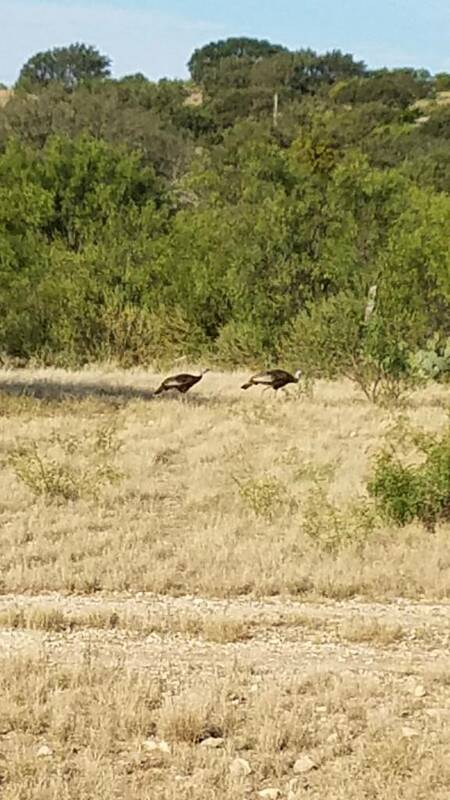 Saw a whole herd of these.. probably 50 Turkey's over the weekend! Doves...nnnnnt! Patton those "huge deer" sure are tempting. Best of luck to you this season. 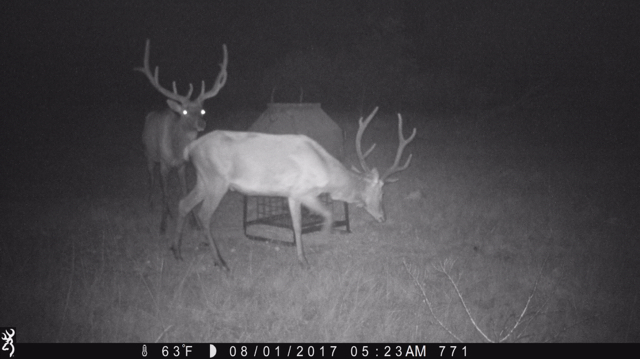 Something tells me that you are going to like what you see from your stand this year. You have quite a selection of good tasting critters to choose from. I'm jealous for sure. What weather station did you get? Do you like/recommend it? I am 20 miles south of Junction off 377. This is the 3rd year I have been on the lease but was invited as a guest several times 2 years prior to that. I am not sure if it is due to us feeding the little bit of protein we put out (4k lbs), feeding corn year round, the little bit of management I have been able to incorporate or the little bit of above average rain we have gotten but our white tail are better than they ever have been in the past 4 years. Still not very big deer but it is exciting to see the improvement. I am really excited to go back again this weekend to check the game cams. We have also been hitting the fox really hard the past 3 years and the quail population has gone up substantially. Also the turkey have come back but I attribute that to us feeding year round more than anything. Yes. You close to that area? Last edited by Fordnandez; 09-11-2017 at 10:52 PM. It's the Davis Vantage Pro2 Plus (Wireless) and yes I would recommend it. It's set up in a location that only has wi-fi (no cell signal) and being able to check everything online remotely is great. Looks like a nice unit. A little out of my price range. I am thinking about getting the acurite 5 in 1. I was at our place North of Campwood over Labor Day. It's getting really dry but the pics on the cameras are looking good. 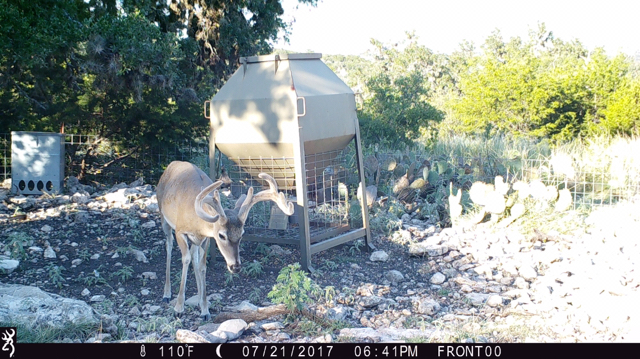 We've got a funky horned buck that my son has already called dibs on. We forgot to check the oaks for acorns, they have been above plentiful the past couple of years. How are the acorns looking this year? Several trees were 'raining acorns' this weekend. Didn't look as large of a crop as years past but certainly a decent one. Glad to hear they're already dropping. Seems like it was October the past couple of years when they started dropping. I'm going to potlick y'all's thread. I have an ad in the Hill Country Herald looking for a family lease out that way. If y'all know of any landowners looking to have 3 hunters, put my name in the hat and thanks! Any of you guys done any big scale cedar removal in the Rocksprings/Junction area? If so how did you do it? I have access to a rubber tire Bobcat but I am afraid I am going to tear it up due to the rocky terrain we have and have a 3k bill to fix it. I believe the guys on our place used a hydraulic sheer attachment as well a hydro-ax. They were using real treads, not rubber. Didn't tear the ground up too bad but there are still a few spots that have a layer of cedar mulch on the ground and grass struggles to grow (been ~6 or 7 years). Most of those spots have been burned are taken care of however. By real treads you mean like tank tracks right? Have you ever compared the rain you get at your place to the "official" rain data for the area? The closest one to me is the junction airport which is probably 25 miles away from where I hunt. Below is a link showing what they have got for the year which is less than 13". The only reason why I ask is it seems that every time I am at my lease I can see rainfall somewhere off in the distance. It seems the rain is VERY isolated in that part of the country. Some, but not much. I would say our personal weather station is pretty 'official' however. According to WeatherUnderground our station is a 'Gold Star Station' meaning it has passed their quality control test for 5 consecutive days. It's actually visible on Wunderground. And I completely agree that rain is isolated out there; I enjoy watching the wunderground NEXRAD radar and clicking 'actual precipitation' when rain is in that area. Gives you a good idea of what is in the clouds and what is actually droppping. Good luck this weekend, I hope you have some great pics. Cool. I am interested to see if there is a big difference in the amount of rain that I get compared to what the airport gets. I will share pictures when I get back on Monday. 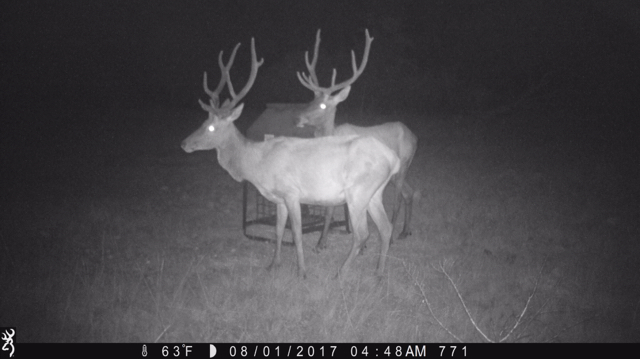 Saw some pretty good deer last weekend. Nothing to brag about but considering what I started with I am pretty excited. Man it is dry out there. Hunt 60acres in Deer Valley. Very Dry!. Only 800 gallons in 1500 gallon rain catch. **** Cows broke my fence down, ate my PVC pipes from Tote to water tank, and ATE MY POP UP. Lots of hogs and does with fawns. All fawns on camera still had spots.